With the changing of the season comes more than just cozy sweaters and pumpkin-flavored…well, everything. It also brings one of our favorite fall programs – KDB’s 20th Annual Community Tree Giveaway! 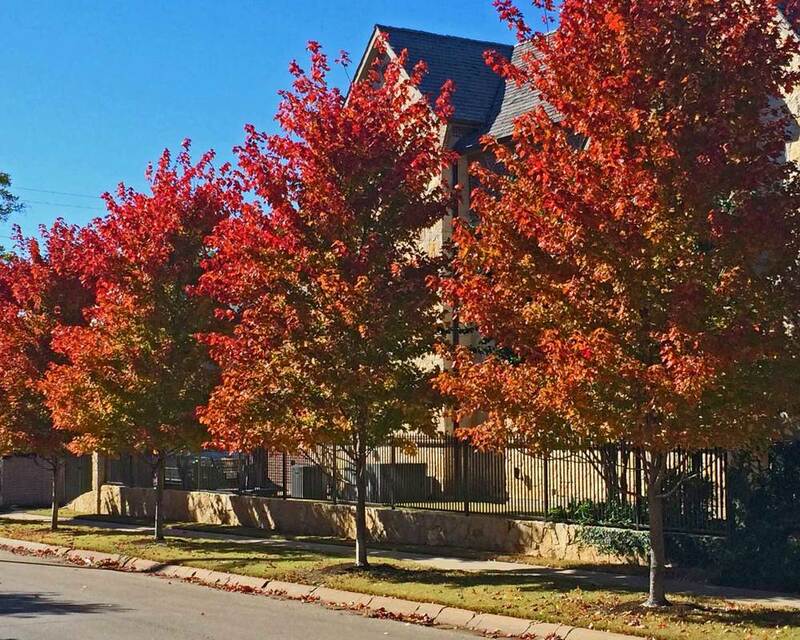 For each Tree Giveaway, we consult forestry industry experts – including our city’s urban forester and KDB Board Member Haywood Morgan – to provide seven different native and adapted tree species specifically for Denton soils and climate. Registration for our 700 available trees opens to the general public Monday, Sept. 17. Want to ensure you get your desired tree? We’ll let you in on a not-so-secret secret: KDB Members get access to registration an entire week prior to public registration. Become a member today to get access as early as Sept. 10! Memberships range from $10-$75 and help to support KDB’s programs. With all this in mind, we’ve put together a quick guide to help you get to know the seven species offered through this year’s Giveaway – whether you’ve got your eye on a specific species, or you’re still making up your mind on your tree selection (don’t wait too long!). This tree is often identified by its stately pyramid shape. It prefers moister soils, and the leaves turn a beautiful rust color in the late summer/early fall. If you’re looking for a flashier tree to bring vibrant color to your yard, maples are the way to go. These trees, often called Red Maples, produce a beautiful fire red color in the fall. Burr Oaks are hearty trees – no joke, they can be burned down and they still come back! These large trees produce beautiful leaves and large acorns and are made for our Texas drought seasons. This is a tree that will last generations! Offering a spread of 50 to 60 feet and growing an average of one to two feet per year, the Chinkapin Oak is classified as both an ornamental and shade tree, if provided with full sun and room to unfurl its branches. A mature Chinkapin Oak; photo: from tamu.edu. Despite what its name may imply, the Lacebark Elm is anything but delicate. Considered a tough landscape tree, it is hardy enough for harsh planting situations like streets, patios, or even parking lots. With a medium growth rate of 3 to 4 feet per year, it grows to a mature height of around 50 feet, encouraging nesting birds and small animals to take up residence in its colorful branches. This tree might smaller than our other species, but it packs a punch in its beauty! Their showy white blooms in the spring smell of honey, which attracts lots of helpful pollinators to your garden. This tree can produce edible plums, hence the name. This one is an excellent choice if you want something a bit different. These species of oak tree is amazing if you have room for a large tree to spread out. They provide beautiful fall color of yellows, oranges, and reds.